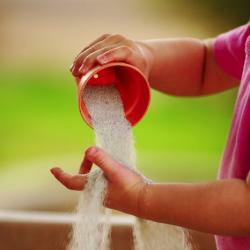 Our play sand is made specifically for children's sandpits and play areas. It is a high quality silica sand that acts as a safe, protective surface for children to play on. Loose fill materials may displace during use, we always suggest that when an impact absorbing surface is desired, the depth is increased according to the degree or maintenance and level of activity. We believe there is no formal requirement or standard for an impact absorbing surface to be used in a residential situation and you should carry out your own risk assessment as appropriate to your individual circumstances. NB Commercial or public areas are covered by more detailed requirements BS EN1176 relating to loose fill impact absorbing products, requiring greater depths of all loose fill products in a public environment. In accordance with BS EN 1177 (2008) an additional 100mm of material should be included to allow for displacement in use. Children love to play in the sand! Give them the beach every day at home with our quality play sand - it makes great sand castles too!